2006 World Open: Emory Tate gets 3rd IM Norm! FM Emory Tate in a pre-game moment of tranquility. 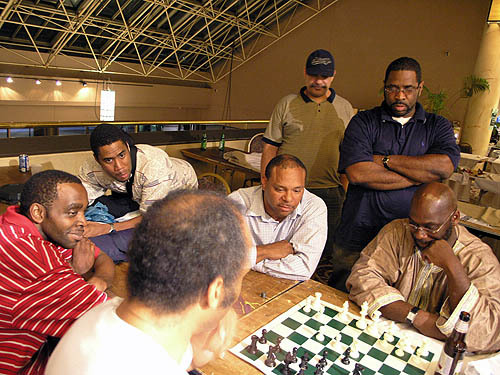 For decades Emory Tate, Jr. has been at the cutting edge of chess. The accomplished tactician gained a crucial step in his quest of the Grandmaster title. In the 34th edition of the World Open, Tate scored the requisite score for earning his 3rd and final norm. With the norm already in hand after eight rounds, he beat Columbian Grandmaster Alonso Zapata in a last-round thriller. 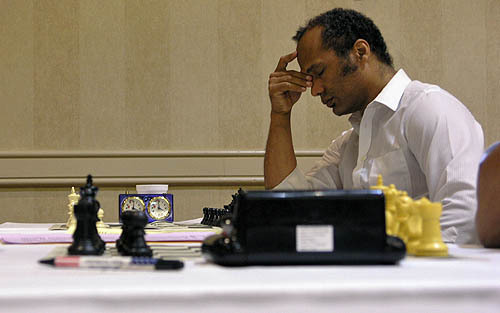 When asked about his accomplishment Tate told The Chess Drum re-emphasized his focus on the GM title, but stated that the IM title was indeed an important step. Tate beat GM Laurent Fressinet of France, but stated that the pivotal game was with rising star Jake Kleiman. He had lost two consecutive games and was determined to "stop the bleeding." "It's odd that beating Kleiman would overshadow that (beating Fressinet). But beating Kleiman was a test of character as opposed to a test of skill. I think we've alluded to the fact earlier that my skills have never been in question and people have questioned other factors, but having lost both games yesterday… that was… and to come back and beat Kleiman this morning with black the way I did… that proved character and it overshadowed beating Fressinet." After having earned his IM norm, Tate gave a public display when analyzing his game with Zapata. A virtual coliseum of 30-40 players gradually formed around the popular master and were treated to his entertaining commentary peppered with wit, imagination and his customary "exclam!" In an exclusive interview, Tate gave a side to the chess world that is not often seen, but those that know him understand his passion and energy for chess. With a renewed vigor and determination, perhaps we have yet to see the best that Emory Tate has to offer. Tate showing his thrilling win over GM Alonso Zapata. Listen to the Tate interview now!